The main Palestinian factions, Hamas and Fatah, have reportedly agreed on a new prime minister in an important step towards forming a unity government. Muhammad Shbeir - an academic from Gaza who is close to Hamas but says he is not a party member - has accepted the offer, according to Hamas officials. 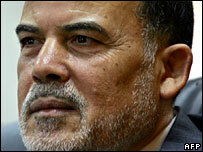 No official announcement has been made by Hamas or current PM Ismail Haniya. The BBC's Gaza correspondent says the factions intend to pick technocrats who will show a moderate face to the world. The two sides have been deadlocked for months over the formation of a national unity government acceptable to the West. Sanctions on the new Hamas-led administration were imposed in March by Israel and Western countries, which see Hamas as a terrorist organisation. The current prime minister, Ismail Haniya, said last week he was willing to resign if it would end the crippling Western aid boycott against the administration. 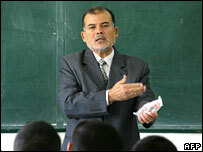 Hamas officials say Mr Shbeir, 60, a former head of Gaza's Islamic University, has been chosen to replace him. Mr Shbeir is said to be close to Hamas - many of whose officials worked at his university - but also to have a good relationship with the Fatah party. His candidacy is supported by Palestinian President Mahmoud Abbas, head of Fatah, officials have told the Associated Press news agency. However, his nomination has yet to be publicly endorsed by Mr Abbas. The BBC's Alan Johnston in Gaza says it seems Mr Haniya is indeed ready to step aside as prime minister. The idea seems to be that the new administration should be made up not of political personalities, but of experts who will present a more moderate face to the world than the current Hamas administration. However, it is not yet clear how it will be received, our correspondent says, and the focus will be firmly on the attitude the new administration takes towards Israel. Western powers and Israel have been insisting that any Palestinian government must start by accepting Israel's right to exist. They are also insisting that Hamas renounce violence and commit to previous Israeli-Palestinian agreements. But there are signs that at least some in the international community are now ready to be more flexible on this most fraught issue, our correspondent says.